a variety of pretend gems, gold coins, coloured glass beads, beaded necklaces, play jewellery, etc. To make your golden playdough “sand,” mix together the flour, salt and Cream of Tartar. Add the oil and water and stir until smooth. Cook over medium/ low heat until dough looks dry, but is still sticky. Let it rest for 1 min, then knead in golden yellow food colouring and sparkles. 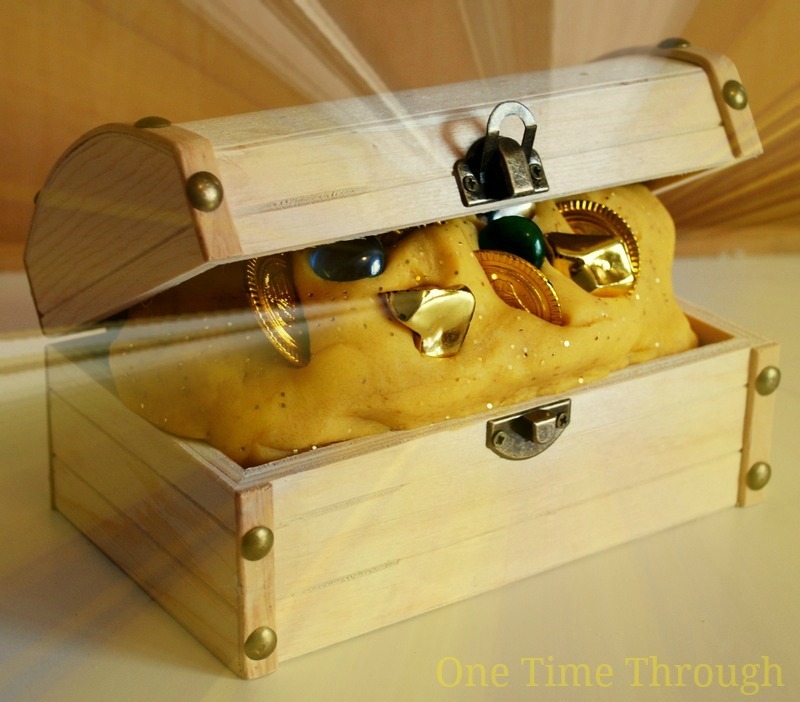 Flatten out your playdough and place all the “treasure” on top. 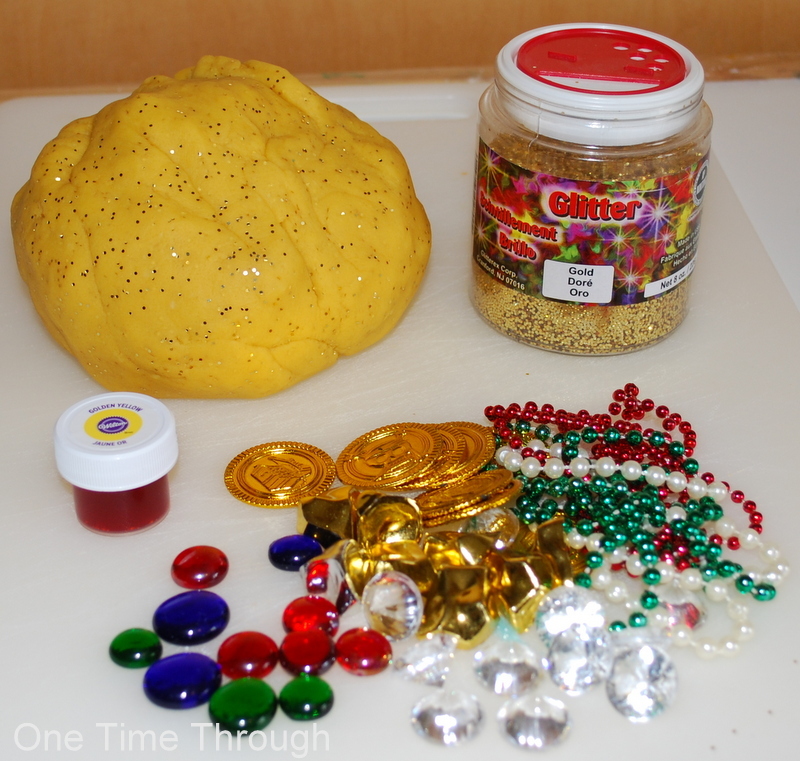 Fold the play dough over the gems and place in a special box. Provide your child with a shovel and tell them you have found a treasure box and wonder what might be buried under the sand! Alternately, this could be the prize treasure that your child finds at the end of a hunt around the house and yard. 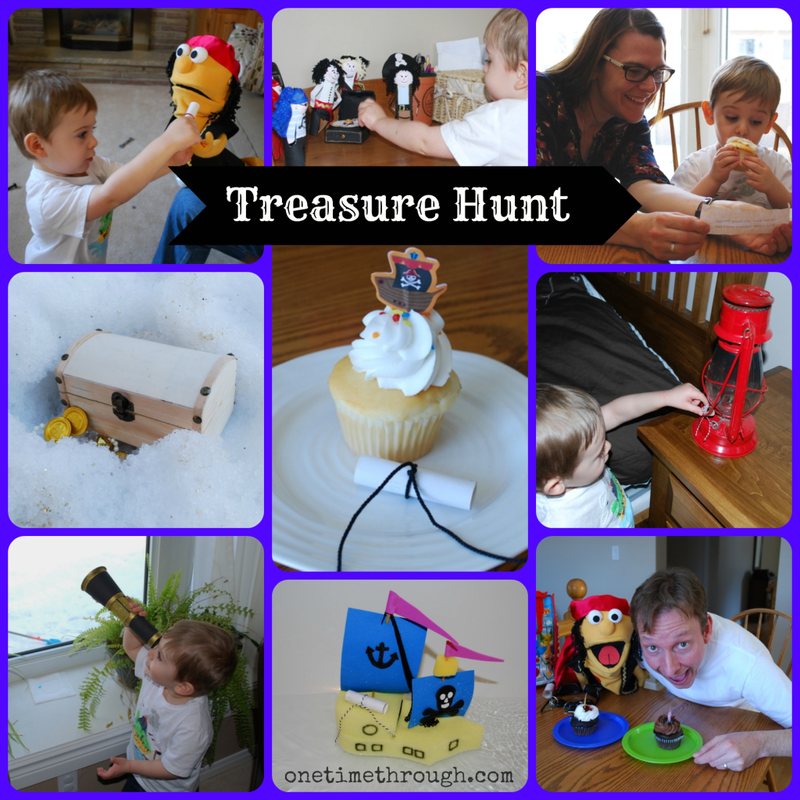 If you’d like a hunt with clues appropriate for preschoolers and up – check out our Pirate Treasure Hunt with FREE printable clues. We had a ton of fun following the clues and then digging up our treasure box in the snow at the end. In the Summer, you could bury the treasure box in a backyard sandbox, or hide it under a bush! 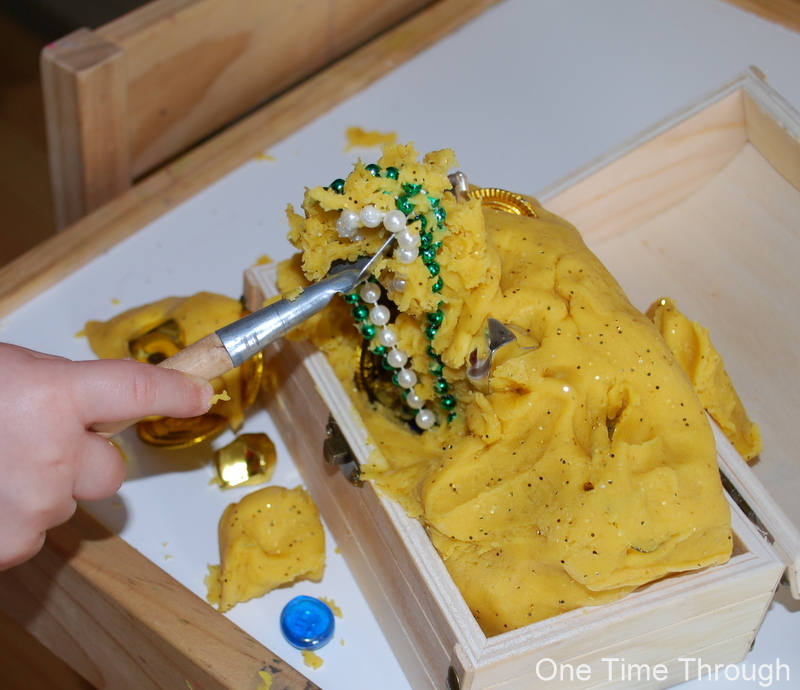 Onetime had so much fun digging and finding all the treasures in this super-soft and sparkly playdough. He especially enjoyed pulling out the bead necklaces. He actually worked away at the digging, and then eventually, squeezing, for close to an HOUR! What a terrific fine-motor workout! 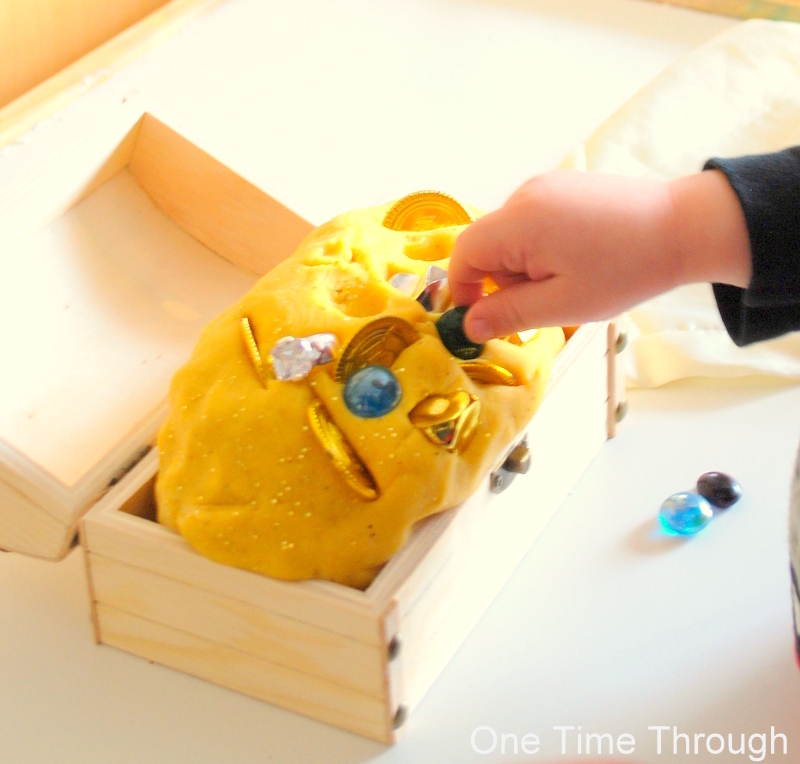 Even after all the treasure had been found, Onetime enjoyed playing by sticking the gems back into the playdough. When we were all done playing with this playdough after several weeks, we used it to create some Beach-Themed Art. To keep your playdough nice and soft, remember to store it in an airtight plastic bag when not in use. Hope your little one digs this activity as much as mine did! I think this recipe is missing water. Not enough liquid to mix it together fyi.